Last week I wrote about Frank Conrad Wolterman, my husband’s paternal grandfather. 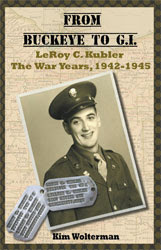 This week Frank’s father, Gerhard (George) Wolterman is the topic of discussion. George was the son of Johann (John) Gerhard and Anna (Klaasen) Wolterman, and he was born 18 December 1859 in Stapelmoorheide, Ostfriesland, Germany. He was baptized 19 December 1859 in Weener, which is 6.7 km from Stapelmoorheide. George’s siblings included: Helena Maria born in 1857, Peter Johannes born in 1862, Gertrude Mary born in 1867, Anna born in 1874, and John born in 1876. The first 4 children were born in Stapelmoorheide, and the last 2 were born in the United States. 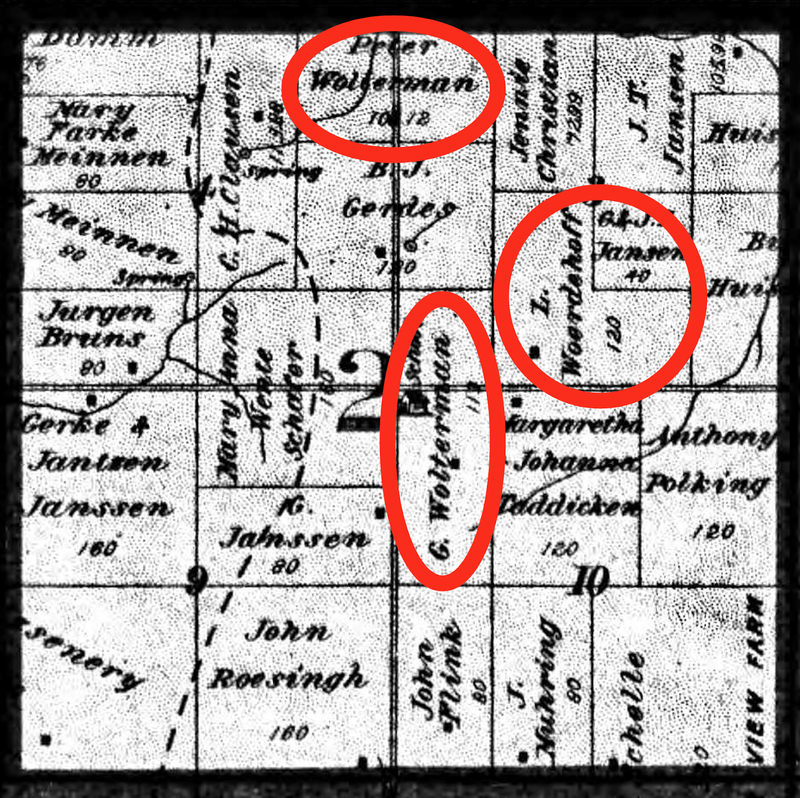 The family name was spelled Woltermann in Germany. 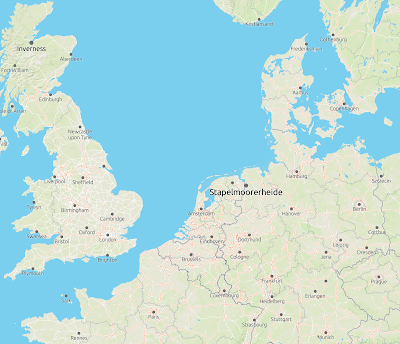 Ostfriesland is an area in the northwest corner of Germany on the North Sea coast. It is located within Germany’s second largest state, Lower Saxony. Stapelmoorheide, in the County of Leer, is about 526 km west of Berlin, and 129 km west of Bremen. It was and is a small rural community. Nearby Stapelmoor was combined with Stapelmoorheide in 1974. 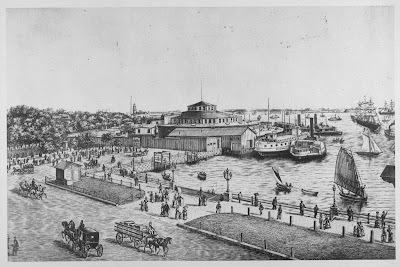 John, Anna and their children emigrated to the United States in 1868, arriving in New York City on 10 April aboard the ship “Manhattan”. It is interesting that they departed from Liverpool, England instead of much closer emigrant port of Bremerhaven. Perhaps the fare was cheaper from Liverpool, but it would be interesting to know how they got from their hometown to Liverpool. The “Manhattan” was a steamship built in 1866 by Palmer’s Shipbuilding & Iron Co. at Newcastle, England. It had 3 decks, an iron hull, inverted engines, a speed of 10 knots, and accommodated 72 First Class passengers, and 800 Third Class passengers. The passage from Liverpool to New York averaged 14.7 days. The captain of the ship was James Williams. John’s occupation was listed as Laborer. 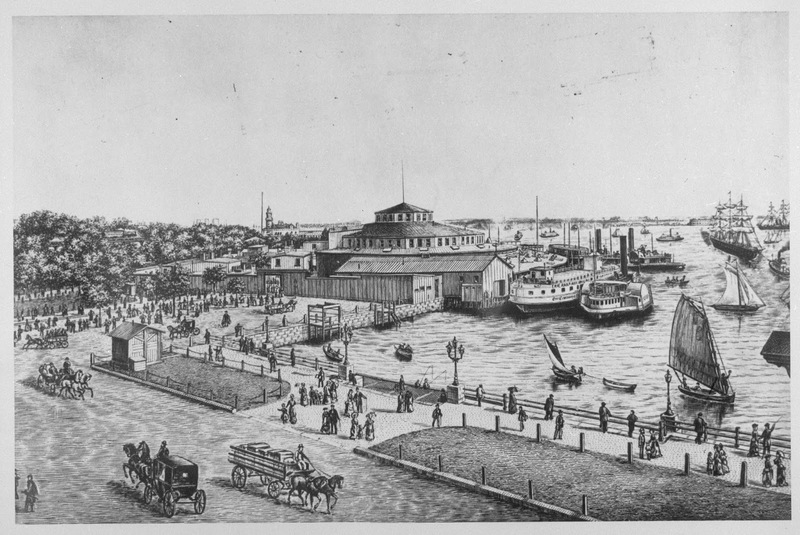 From August of 1855 until April of 1890, immigrants arriving in New York were processed through the Emigrant Landing Depot at Castle Garden. Over 8 million immigrants came through this center during that time period, most of whom were from Germany, Ireland, England, Scotland, Sweden, Italy, Russia, and Denmark. More than 1 in 6 native-born Americans are descendants of the 8 million who entered the United States through Castle Garden. 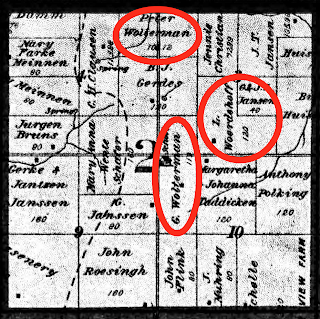 The Wolterman family first settled in Forreston, a small village in Ogle County, Illinois, but by 1874 they were living in Wheatland Township, Carroll County, Iowa where they had a family farm. 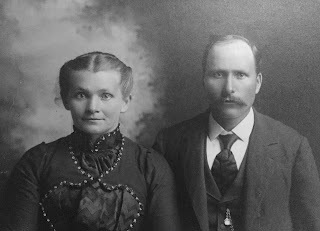 On 6 February 1883, George married Catherine Woerdehoff in Breda, Carroll County, Iowa. George was 23 years of age and Catherine was 20. 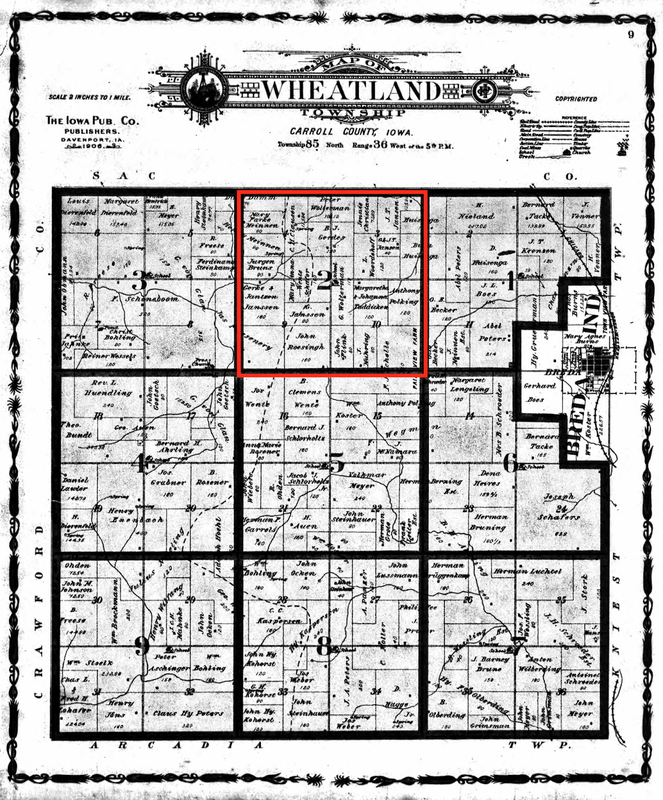 On the Wheatland Township land map from 1906, which I have enlarged below, you can see that the Wolterman land was adjacent to the Woerdehoff farm, so perhaps that is how George and Catherine met. George's brother Peter also owned a nearby farm. George and Catherine had the following children: Margaret born in 1883, John Alvis born in 1885, Anna C. born in 1886, Gertrude born in 1888, Catharine Margaret born in 1889, Gerhard Jacob (George) born in 1891, Bernadine born in 1893, Peter J. born in 1895, Leonilla Mary born in 1898, Frank Conrad born in 1899, Clara Helena born in 1901, Edmund J. born in 1903, and Albin A. born in 1907. George continued to farm until his death on 31 March 1921. He was 61 years old. 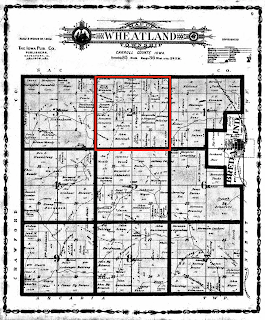 By the 1930 census, Catherine owned a home valued at $1,800 in the town of Breda. 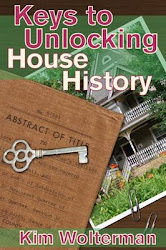 She was living next door to her daughter Catherine Margaret Ocken. Catherine died 15 August 1935, and she and George are both buried in Saint Bernard Cemetery in Breda.